Dimensions (H W D): 15" x 9.75" x 12.25"
Our BP-200 bookshelf loudspeakers exemplify the notion that good things indeed come in small packages. Realizing the need for smaller, more discreet front channel loudspeakers we have developed the BP-200's. 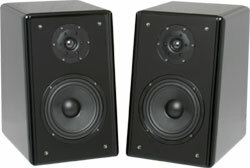 Although much smaller than a typical floor standing tower speaker these speakers lack absolutely nothing in performance. Capable of handling 200 watts of power and reaching all the way down to 35 Hz on the low end our BP-200's will easily compete with any of the larger tower models found on the market, in many cases blowing them away. The cabinet features a high gloss piano finish and a rear port bass reflex design with separate enclosures for both the 1" pure silk dome tweeter and 6.5" woven cone woofer.